It’s basically a story about love; or rather, love lost. It’s the story of Jenny, who after countless bad relationships – mostly found on social media and dating apps – is pushed to the limit and decides to mend her broken heart by having a Valentine’s Day dinner with her current ex Brad and six of her exes, whom she had recently slaughtered. Well, the first two films I directed for Horror House did very well and were well received, but both films focused on the senses. Our writer Brantley [Brantley J. Brown interview - click here] and I had decided to do something different, something that had some meat… and dialogue! So what better than a story of a woman who monologues for 8 minutes to six dead bodies and a guy tied to a chair. As for Love Me Not as a collaboration… Brantley and I have learned to trust each other as artists. As a fellow writer it is important for me to keep the original content as much as possible – that is our blueprint after all. If I feel there needs to be any changes, I talk to the parties involved – if possible – to ensure that the changes we make are best suited for the story. Screenwriting is storytelling and directing is VISUAL storytelling – either way it all comes down to story. Well in all honesty, I feel like both the horror and comedy of Love Me Not come from the story. When you are true to the story, the honesty of it comes out. I approached Love Me Not as struggle of a woman dealing with loss rather than a horror story. Seeing her pain is more real and honest and justifies to the audience the validity of Brad’s murder. Well the advantages were that once everything was lit and dressed it was only a matter of tweaking lights when we did coverage. The challenges were trying to make a woman monologuing for 8 minutes interesting. We shot everything mostly on a slider, so even when she was standing still there was slight movement. I had her walk around the table and interact with the dead bodies – after all, she still loved them. A lot of this was answered above in the two previous questions. I like to approach directing much the same way Hitchcock does, in that, I focus on the story and the best way to visually portray that. In Stalk, we were mostly handheld since it was story of a woman walking home alone at night. With Love Me Not it was a story of a Valentine’s Day dinner. So for this project we focused on a color palette since the table was decorated with rose petals and Valentine’s Day cards and blood! Jenny wore a purple dress and Brad’s shirt was purple as well. And then we used blue in the hallway. Also, I should point out, I love candles. The shadows they cast on the walls and on the actors is very sinister. We had a huge candle we used in Soundbite and it was very effective. I also believe in subtlety. It’s my job to tell a story for the audience to enjoy. If I start cramming a message down your throat then I’ve lost the audience’s interest. Well I met Vanessa Esperanza [Vanessa Esperanza interview - click here] at a film festival award ceremony I was directing. She was our Emcee. She was brilliant. She was so funny and charming, plus I found her elegant and classy. 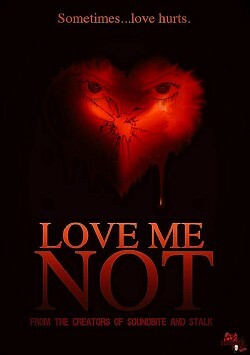 To me, the character of Jenny in Love Me Not was someone who was tragically beautiful. She came off like Miss Havisham in Dicken’s Great Expectations. Plus Vanessa has great acting experience in drama and horror. And I was excited to have a Latina lead in a horror film, as that is something you do not see. As for Brad, played by David Blanco. David is a good friend of mine. When our actor had to pull out at the last minute due to a personal conflict we scrambled to find an actor. He was 6’3 and we had already bought the suit to fit his size. David is 6’2 which helped. I knew he was an actor and was looking for more roles – and he has a great look. It also worked out that he is Latino. It was serendipitous! I agree that things happen for a reason. Overall Love Me Not has been greatly received. People seem to really love our first two films Soundbite and Stalk mostly because I think they are short and precise. This is the fist film we have done that is more in-depth and with more dialogue. I think we took people by surprise with this one. I never expect everyone to enjoy each one of our films – even the horror genre has sub genres. I am glad though that everyone enjoys the look of the film as well as the writing and acting. Brantley and I have many things that are stewing… so definitely. We have an idea for a continuation of Stalk – as it has two separate story lines we are exploring. We are also developing a series for Horror House. I have a twin sister and I’m an Aquarius!